I won't be hosting Weekend Bloggy Reading this week because I want to join Melissa's Favorite Things party on Friday. So I thought it might be fun to highlight some of the ideas you all submitted for the Thanksgiving Recipe Round-Up. It's open until Friday, and I invite you to come by and link up any old or new posts that share Thanksgiving related recipes, tips, tricks, tablescapes, etc. I'll do another update over the weekend! ~Jennifer shared a Cheesy Hashbrown Casserole Recipe. I loves me some cheese. ~I am fairly certain that Jo's Chocolate Pecan Pie is my dream come true. 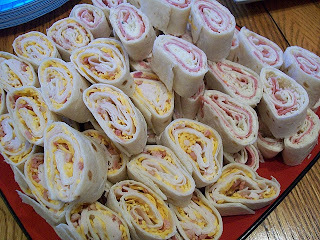 ~Carmen reminded us that you should serve Appetizers on Thanksgiving Day so you aren't attacked by a hungry mob. ~Don't you want to swoon over Beth's Thanksgiving Tablescape? She got my wheels a turnin'. Do you have some great recipes or Thanksgiving ideas to share? Please come by and link your post up. 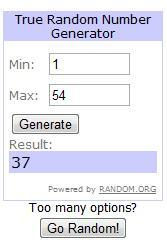 In (belated) news, the winner of the Stitch Sense Designs Giveaway is #37, Veronica of Life in the Thrifty Lane. See? It does pay to link up with Weekend Bloggy Reading! Congratulations, Veronica. Send me an email and I'll get you in touch with Nadir! TOMORROW: A Giveaway from RJ Charms! Thanks for including me in the highlights. :) Our Thanksgiving is going to be very laid back. So I don't have much to plan. I just have to go grocery shopping. I can't wait to hear all about your Thanksgiving! Chocolate pecan pie sounds really yummy! All three of these recipes look great! I forgot about chocolate pecan pie! YUM! Love me some hash brown casserole and the "gather" on that table is precious! Great ideas! Oh that table is killing me. Just gorg. Some people just have the touch. Mmmm, what a great round-up!